- One or more DB instances. 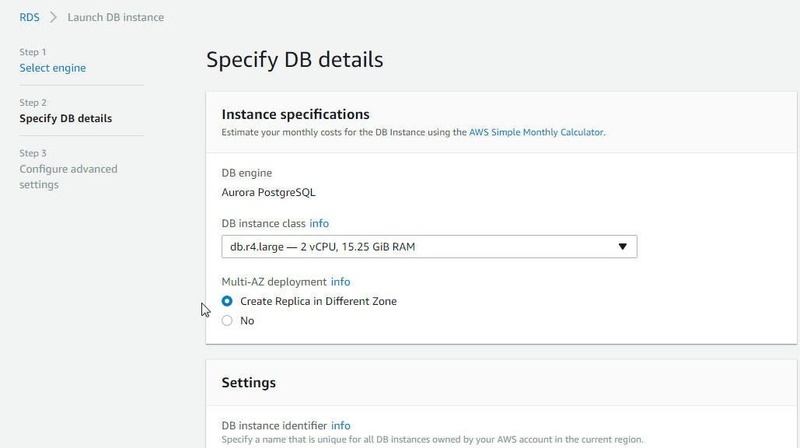 A DB instance could either a Primary instance or an Aurora replica. The difference between a Primary instance and an Aurora replica is that the Primary instance supports read and write operations while an Aurora replica only supports read operations. Multiple replicas (up to 15) may be created to distribute the read load, which may be distributed even across multiple availability zones. - A cluster volume to store data. The cluster volume is SSD (Solid State Disk) drives based virtual volume. A cluster volume grows with the data storage requirements up to 64 TB. 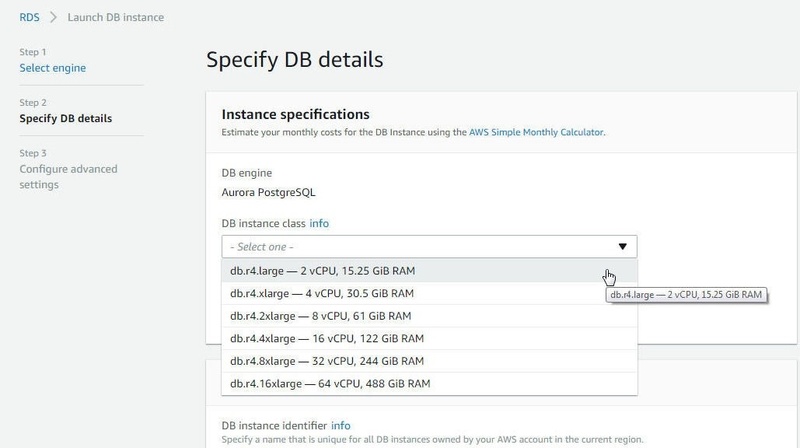 The Primary instance performs all the data modifications to a cluster volume. The benefits of using Aurora DB is that it is a high performance, high throughput, and reliable managed service. Managed service implies that most of the tasks including backup and recovery, provisioning, patching, failure detection and repair are handled automatically. In this article we shall use Toad Data Point with a PostgreSQL-compatible Aurora DB instance. 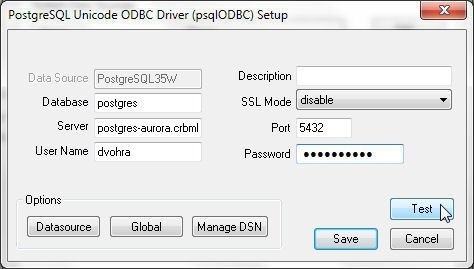 Aurora DB supports PostgreSQL version 9.6.3. The article has the following sections. Create an AWS account at https://aws.amazon.com/resources/create-account/. 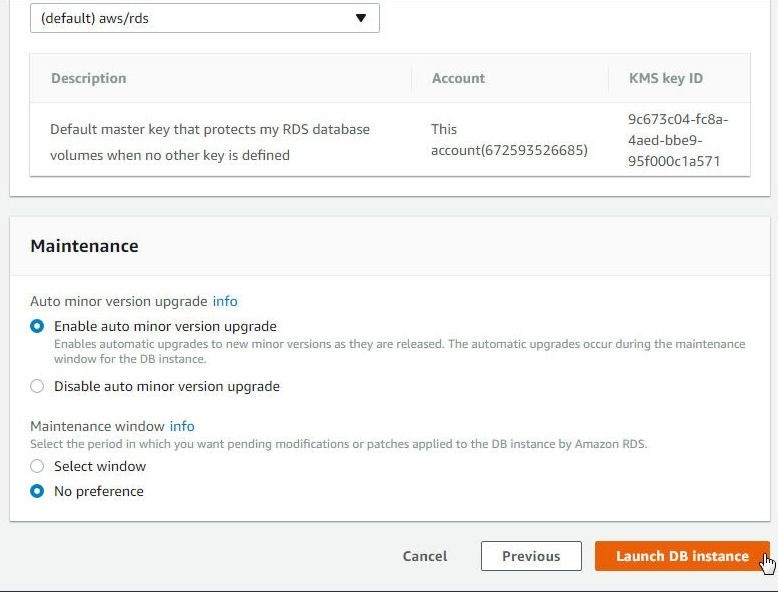 Access the AWS RDS service at https://console.aws.amazon.com/rds and click on Get Started Now to launch the RDS Console. Select the Amazon Aurora engine as shown in Figure 1. Scroll down and select Edition as PostgreSQL-compatible as shown in Figure 2. Click on Next. In Specify DB details select a DB Instance class as shown in Figure 3. 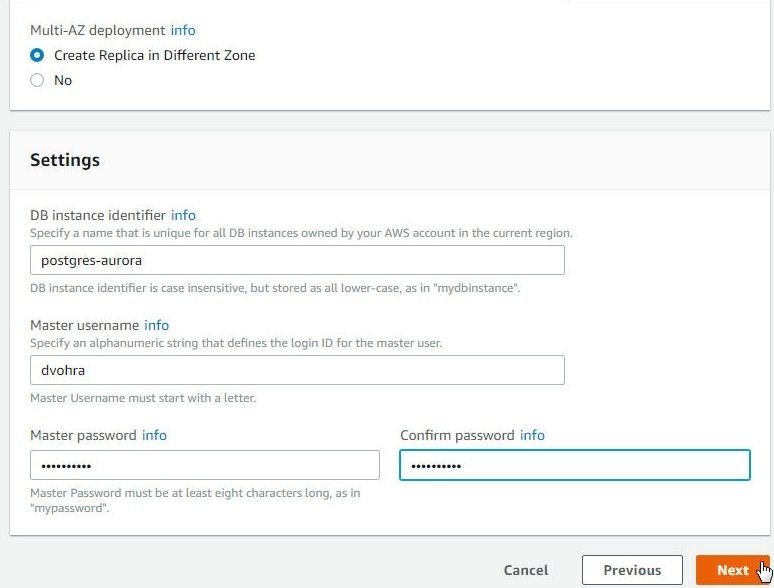 In Multi-AZ deployment select the option to Create Replica in Different Zone as shown in Figure 4. Creating replica in a different availability zone provides high availability. 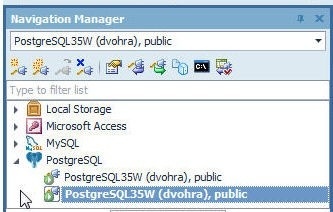 In Settings specify a DB instance identifier (postgres-aurora), a Master username and a Master password as shown in Figure 5. Click on Next. 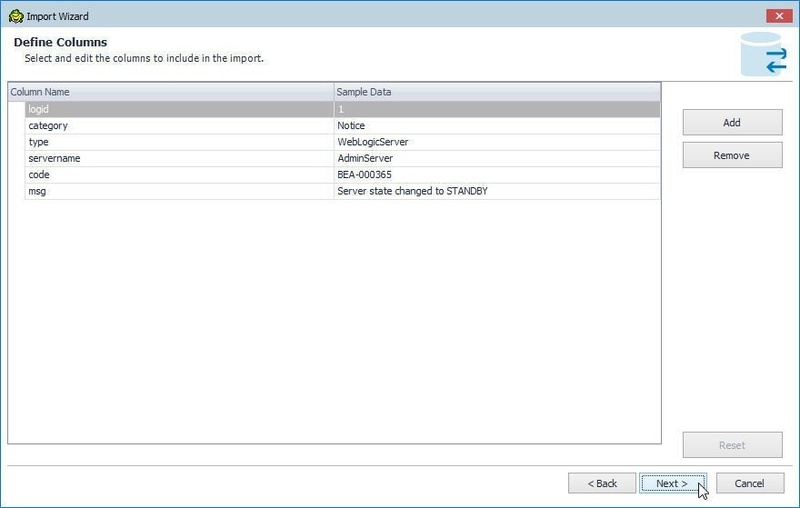 In Configure advanced settings select Create new VPC as shown in Figure 6. Alternatively, select a pre-existing VPC. 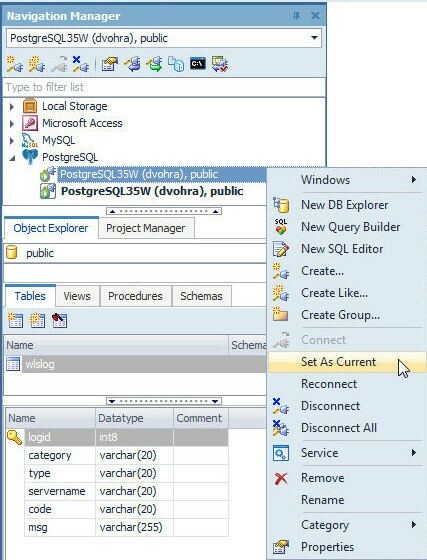 To be able to access the Aurora DB instance outside the VPC select Public accessibility as Yes as shown in Figure 7. 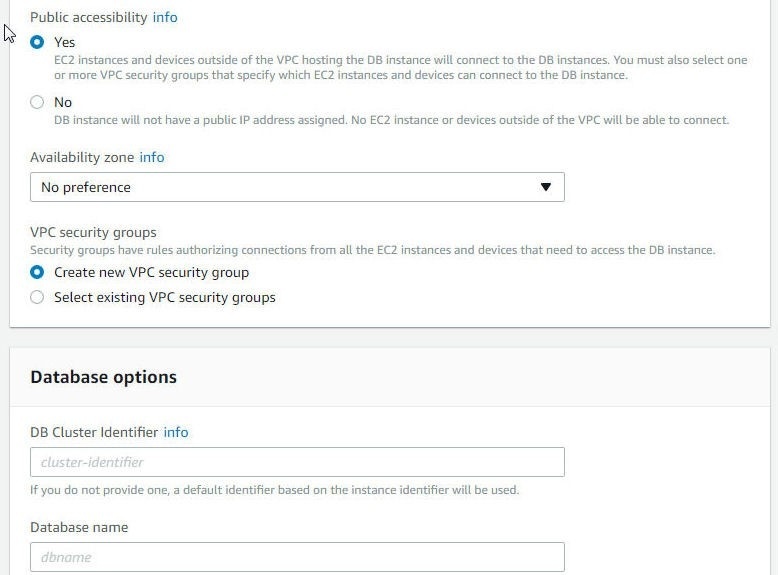 Select Availability zone as No preference and select the option to Create new VPC Security group. 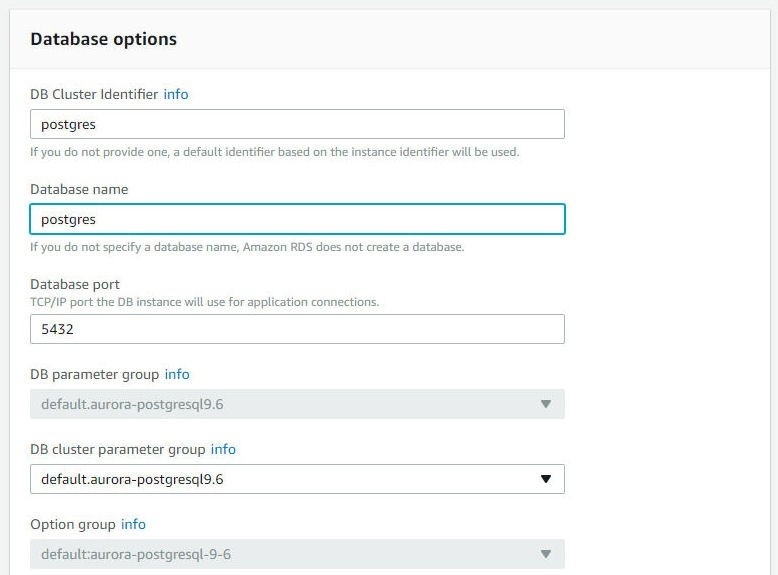 Next, specify the Database Options, which include a DB Cluster Identifier (postgres), Database Name (postgres), and Database Port (5432), as shown in Figure 8. 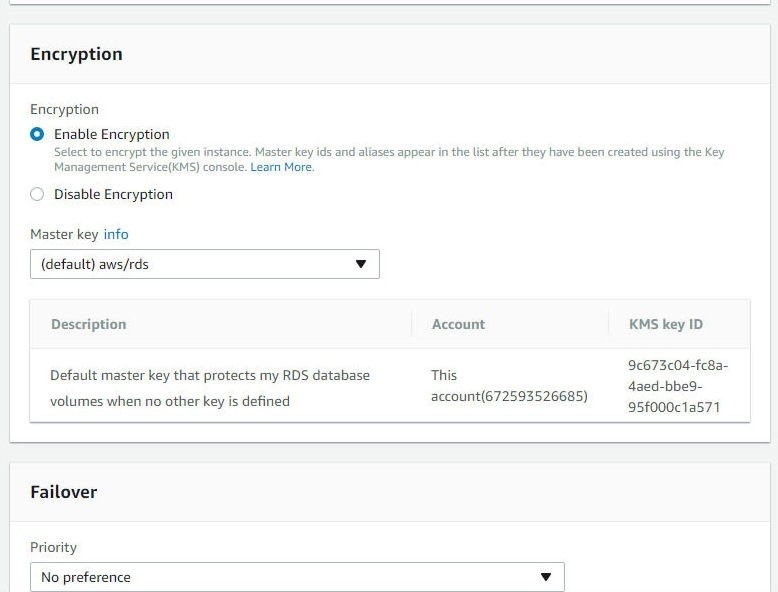 In Encryption section select Enable Encryption and select a Master key as shown in Figure 9. Select a Failover Priority, the default being No preference as shown in Figure 10. 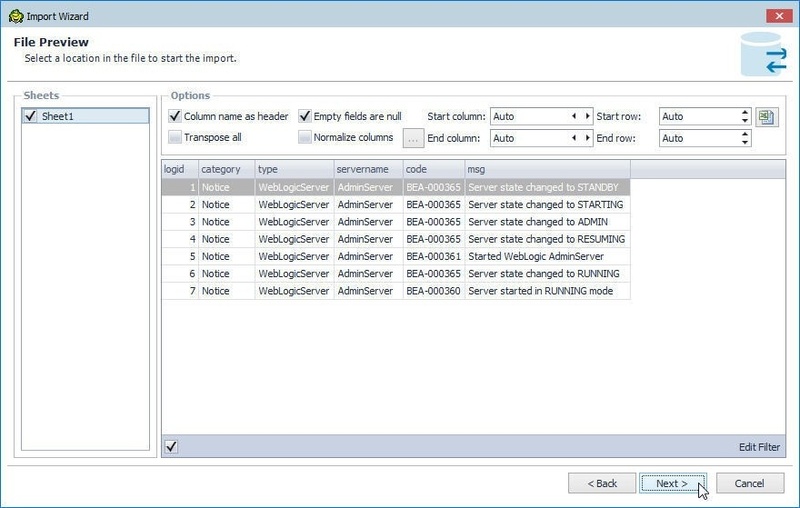 In Backup keep the default setting for Retention period. 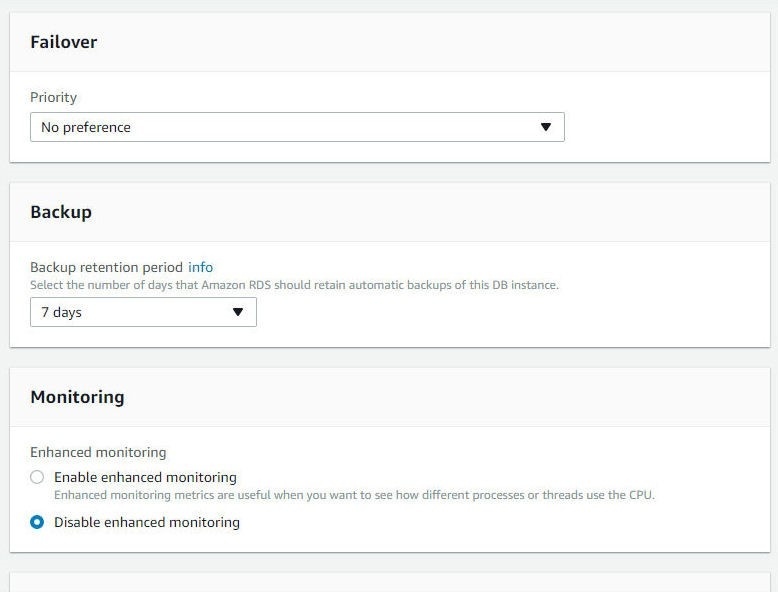 Select to Disable Enhanced Monitoring. The other settings that may be configured are Performance Insights and Maintenance. Click on Launch DB Instance as shown in Figure 11. A new VPC and Subnet Group get created. Click on View DB Instance Details. An Aurora DB cluster gets created, as shown in Figure 12. 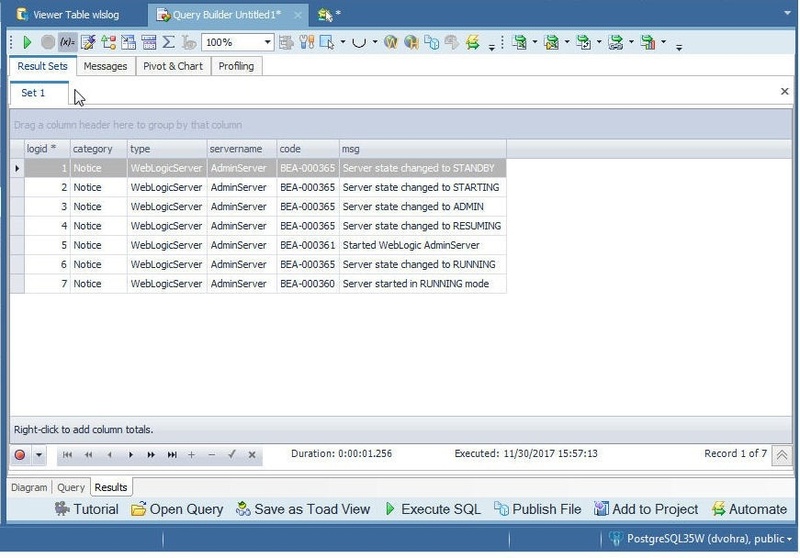 Click on RDS>Instances in the RDS Console to display the Primary instance and replica as shown in Figure 13. 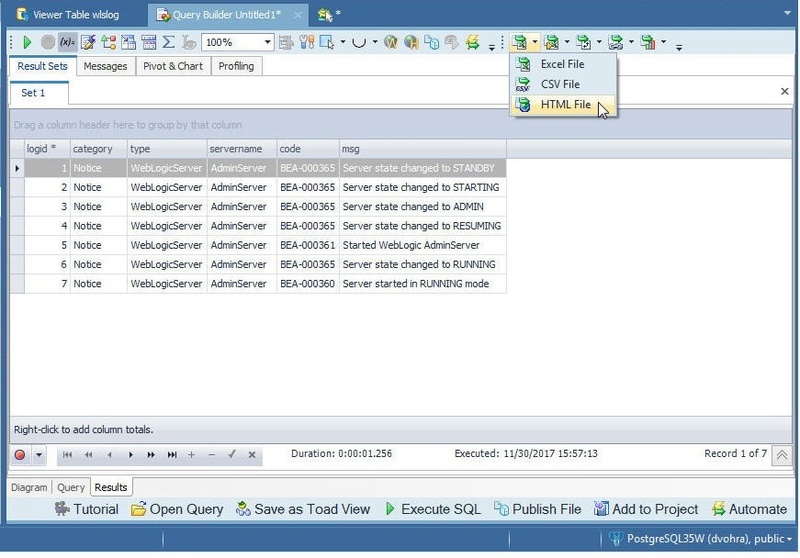 To get configuration information detail including the endpoint to connect to, click on the Primary instance link as shown in figure 14. 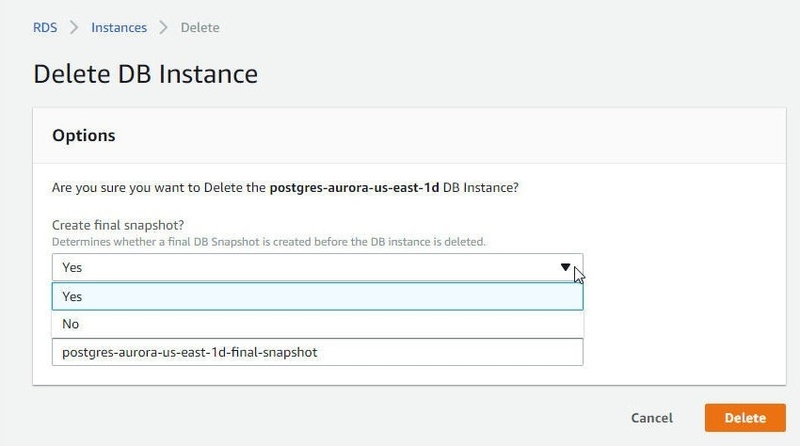 In the RDS>Instances>postgres-aurora Summary and Details page the cluster endpoint at which the RDS DB instance may be connected to is displayed in the Connect section, as shown in Figure 15. The Details section lists the DB Name and Username among other settings, as shown in Figure 16. The default Security group for a RDS DB instance in a VPC has only one Inbound rule configured of type CIDR/IP which allows access from a specific IP address in a VPC. To allow access from the machine on which Toad Data Point is installed the Security group needs to be modified. Click on the Security group link in the Details section as shown in Figure 17. Select the Inbound tab and click on Edit for the inbound rule as shown in Figure 18. In Edit Inbound rules add the IP address of the machine on which the Toad Data Point is installed. If the IP address is not known, cannot be ascertained, or if access from multiple IP addresses is required, select Type as All traffic, Protocol as All, Port Range as 0-65535, Source as Anywhere, as shown in Figure 19. Click on Save. The modified Inbound rules are shown in Figure 20. In this section we shall configure an ODBC Data Source for PostgreSQL database. 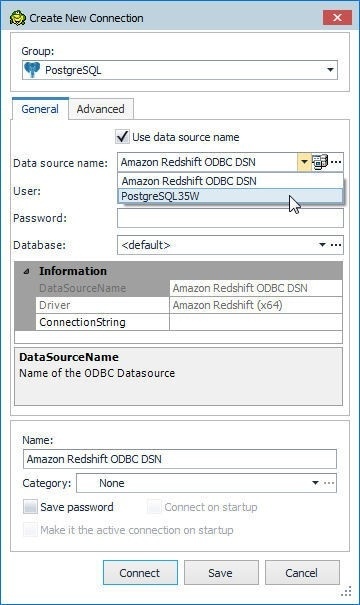 Select Data Sources (ODBC) in Administrative Tools as shown in Figure 21. Select System DSN (not User DSN) and select PostgreSQL35W data source as shown in Figure 22. Click on Configure. 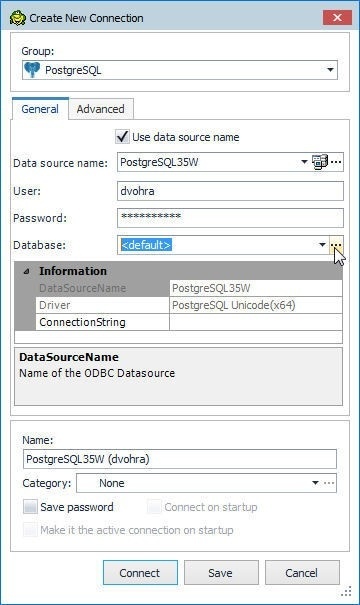 If the PostgreSQL35W data source is not listed click on Add… to add a data source for the PostgreSQL Unicode (64x) driver. 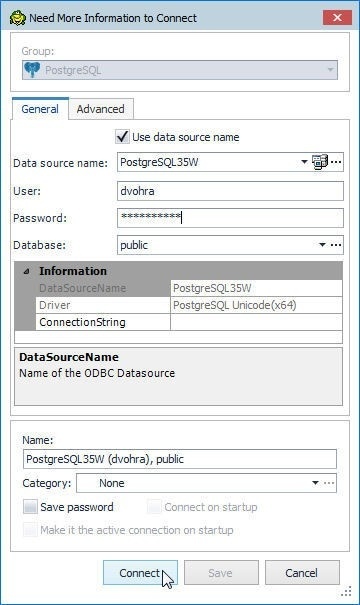 In the PostgreSQL Unicode ODBC Driver Setup specify Database as postgres, and Server as the Endpoint copied from the Connect section in Figure 15. Specify Port as 5432 and user Name and Password as the Master Username and Master Password, respectively. Click on Test as shown in Figure 23. 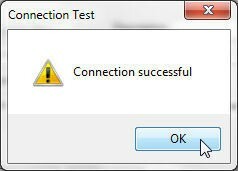 A Connection Successful message in a Connection Test window gets displayed if a connection gets established, as shown in Figure 24. 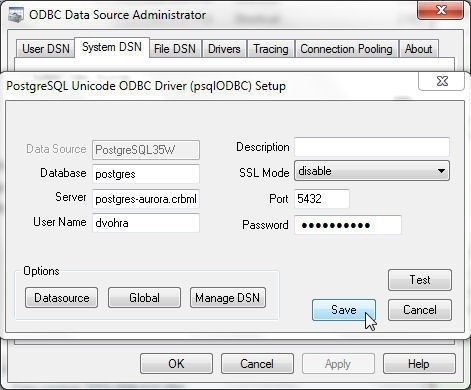 Click on Save to save the PostgreSQL Unicode ODBC Driver Setup as shown in Figure 25. 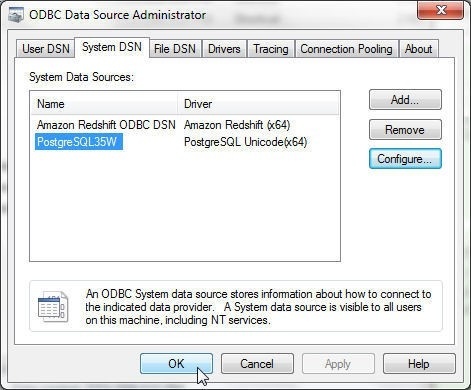 Click on OK in the ODBC Data Source Administrator as shown in Figure 26. 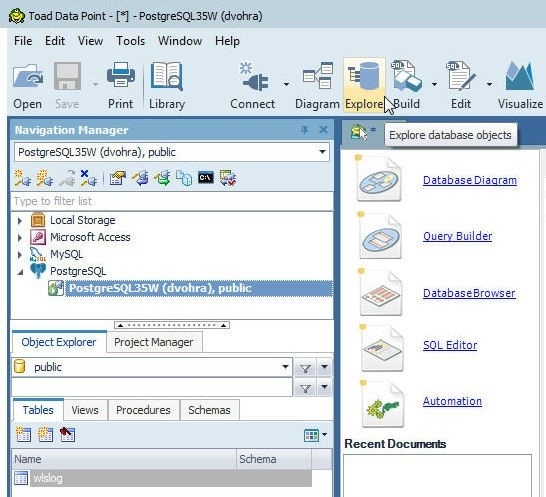 To create a connection to PostgreSQL-compatible Aurora DB click on Connect>New Connection in Toad Data Point as shown in Figure 27. 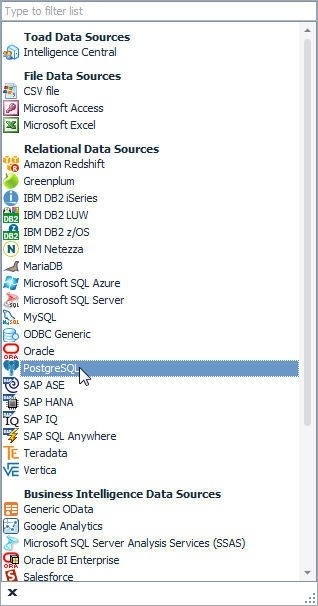 In the list of data sources select PostgreSQL from the list of Relational Data Sources as shown in Figure 28. 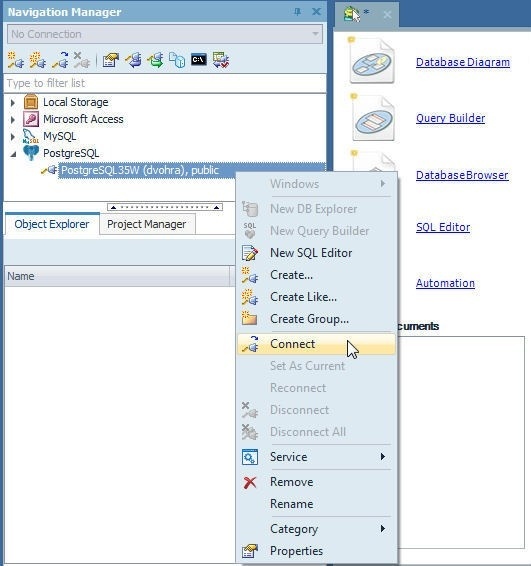 In Create New Connection wizard, click in the Use data source name checkbox and click on the selector button (…) for the Data source name field as shown in Figure 29. 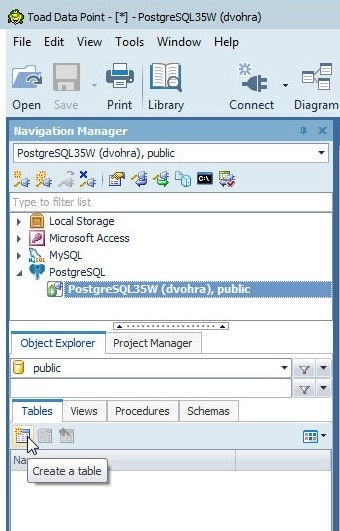 Select the PostgreSQL35W data source as shown in Figure 30. Specify User and Password as the Master Username and Master Password as shown in Figure 31. 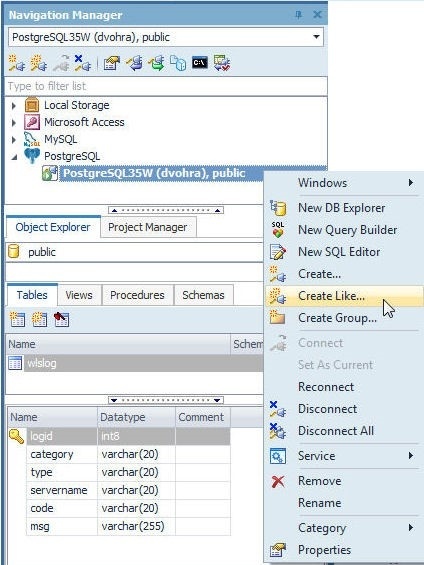 Click on the selector button (…) for the Database field. A confirmation dialog gets displayed prompting the user whether to Continue, as shown in Figure 32. Click on Yes. 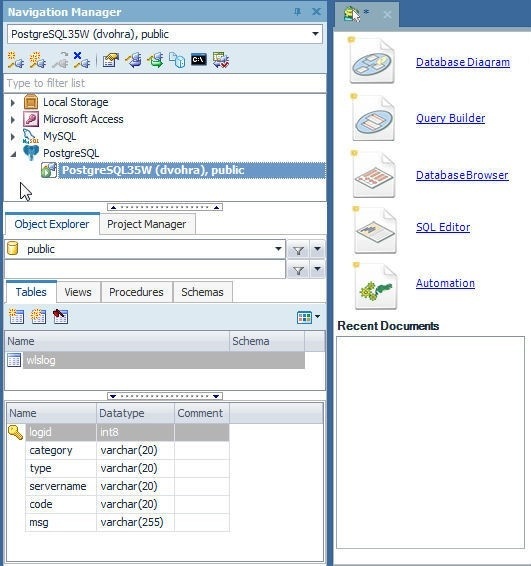 Select the Database public as shown in Figure 33. 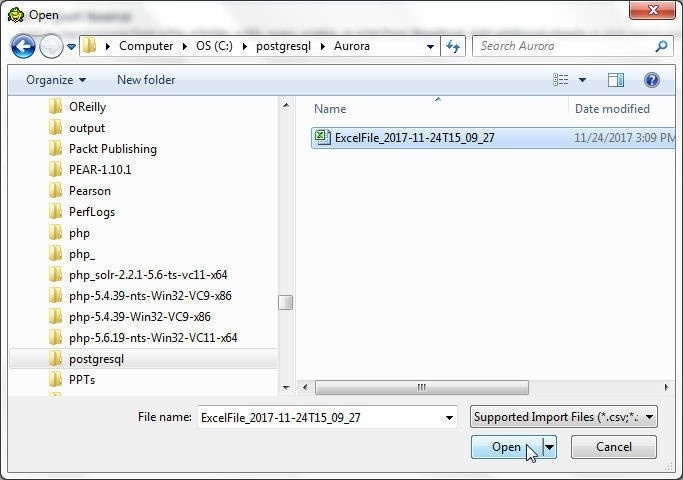 A connection to Aurora DB instance gets created, as shown in the Navigation Manager in Figure 34. 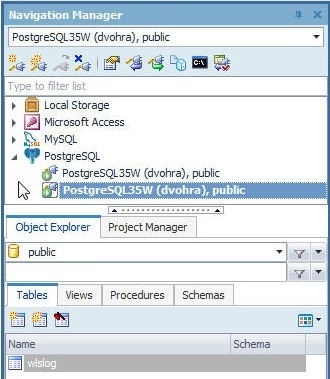 To create a new database table select the public schema in the Object Explorer and, with the Tables tab selected, click on Create a table as shown in Figure 35. 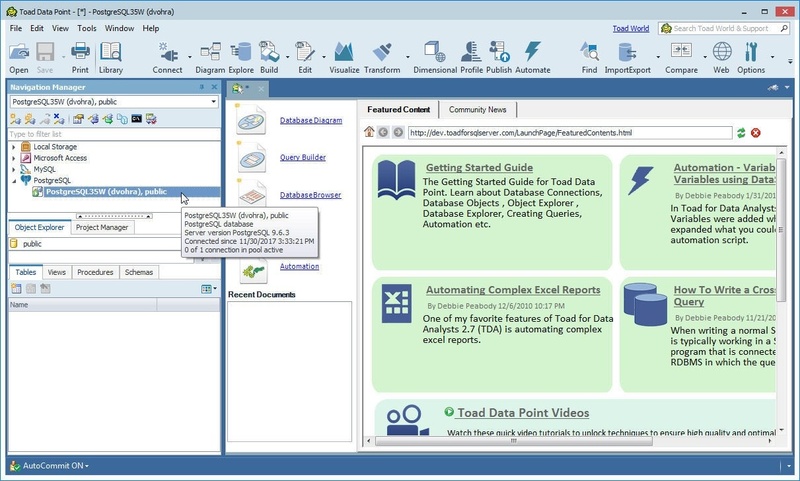 The Create Table wizard gets launched, as shown in Figure 36. We shall create a table definition for a table called wlslog with fields logid (int) as primary key, and fields category, type, servername, code, msg of type string. 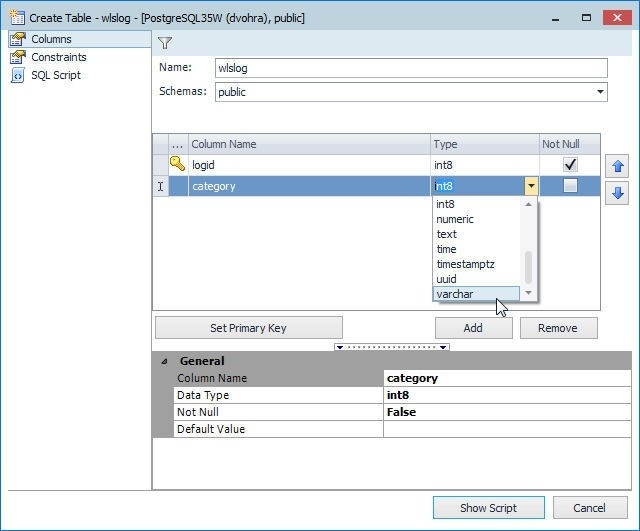 Specify the table name (wlslog) in the Name field with the Schema field value preselected as public as shown in Figure 37. 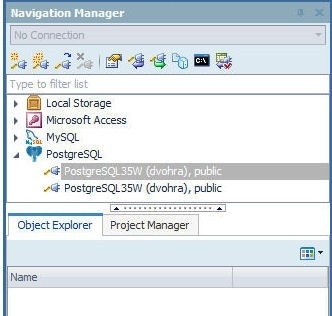 Modify the default column name from Column_1 to logid. Select the Not Null checkbox and click on Set Primary Key as shown in Figure 37. Click on Add to add each of the other fields as shown in Figure 38. Specify field name in the Column Name column and select field type in the Type column, as shown for the category field of type varchar in Figure 39. Similarly, add the other fields as shown in Figure 6. The default length of a field of type varchar is 40. Modify the Length of the msg field to 255 as shown in Figure 41 and click on Show Script. 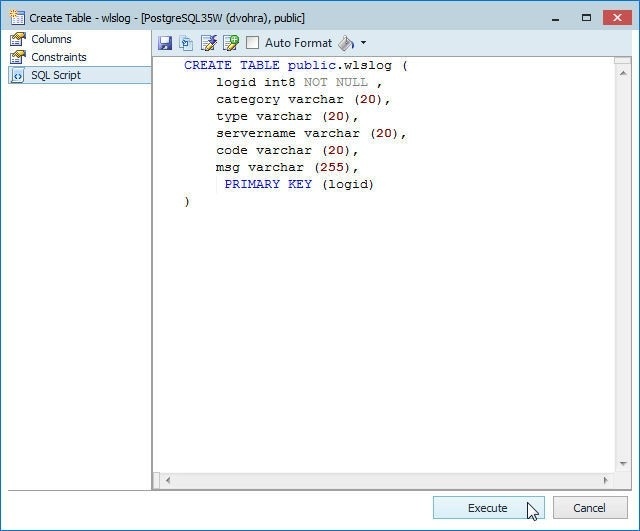 The DDL SQL script for the table gets displayed, as shown in Figure 42. Click on Execute to run the SQL script. If the table gets created a Table successfully created dialog gets displayed, as shown in Figure 43. 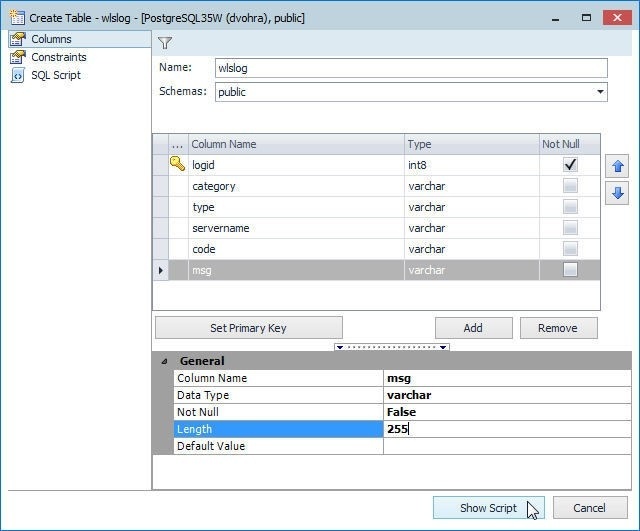 The new table does not get listed in Object Explorer automatically. Click on View>Refresh All as shown in Figure 44 to list the table. 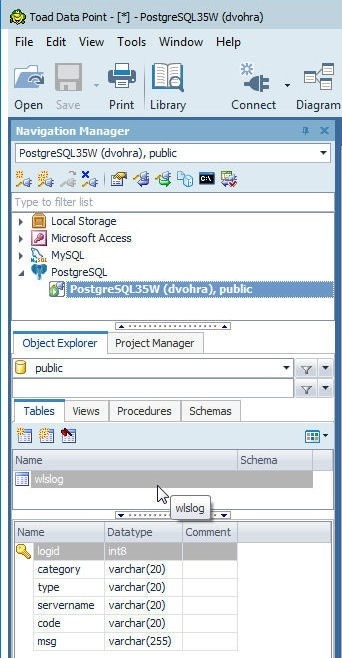 The wlslog table gets listed in Tables tab in Object Explorer as shown in Figure 45. 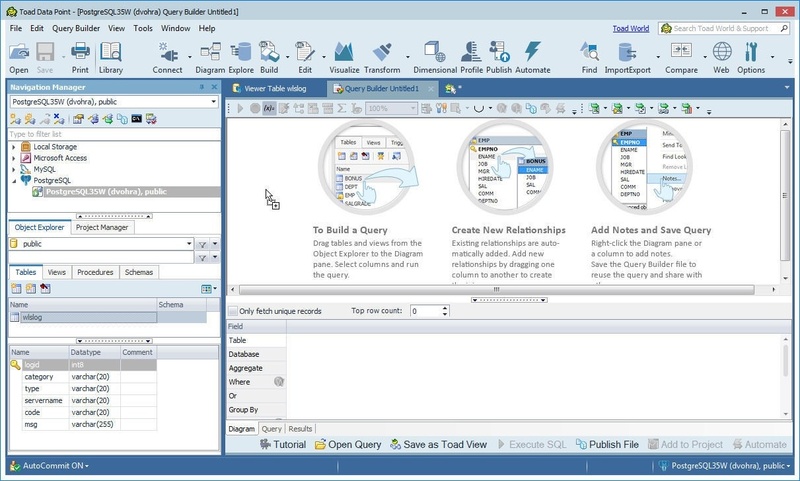 To explore the database objects click on Explore in the toolbar as shown in Figure 46. The Viewer Table wlslog gets displayed as shown in Figure 47. The Columns tab is selected by default. 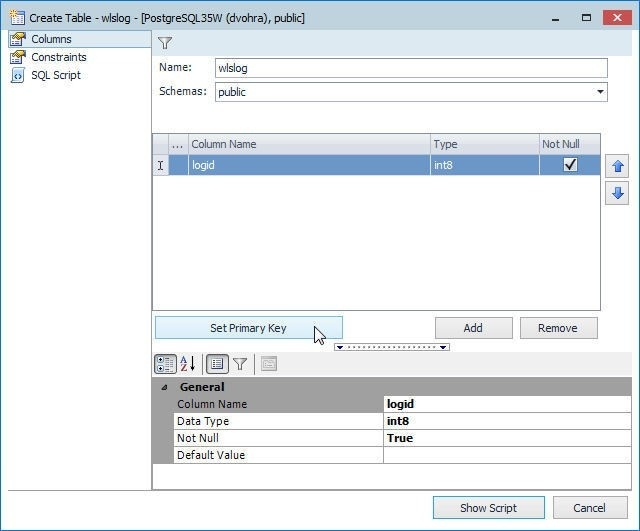 Click on the Data tab and no data is selected for the new table, as shown in Figure 48. In this section we shall import table data from an Excel spreadsheet, which is shown in Figure 49. The Excel spreadsheet must have the same column header names as the database table into which data is to be imported. 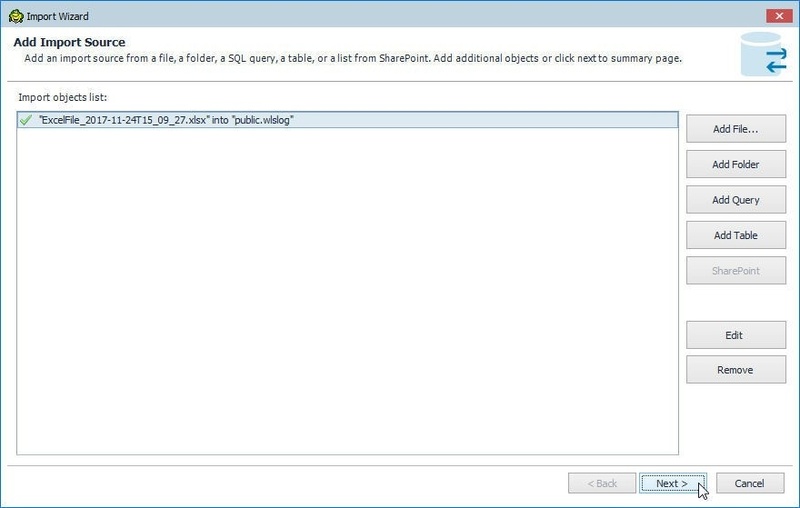 To import data right-click on the wlslog table in Object Explorer and select Import Wizard as shown in Figure 50. The Import Wizard gets launched, as shown in Figure 51. Click on Add File… to add a field from which data is to be imported. Supported import files formats include .csv, .xls, .xlsx, and .xml. Select the Excel CSV file from which data is to be imported and click on Open as shown in Figure 52. The File Preview lists the data that is to be imported, as shown in Figure 53. Different checkboxes and drop-down selectors displayed for the data to import are Column name as header, Empty fields are null, Start column, Start row, Transpose all, Normalize column, End column, and End row. The default setting of Auto is kept for the drop-down selectors. The checkboxes Column name as header and Empty fields are null are selected. Click on Next. In Define columns the columns to include in the import may be selected, as shown in Figure 54. By default data from all columns are imported. Click on Next. Next, select the target table to import data into in the Select Target window as shown in Figure 55. 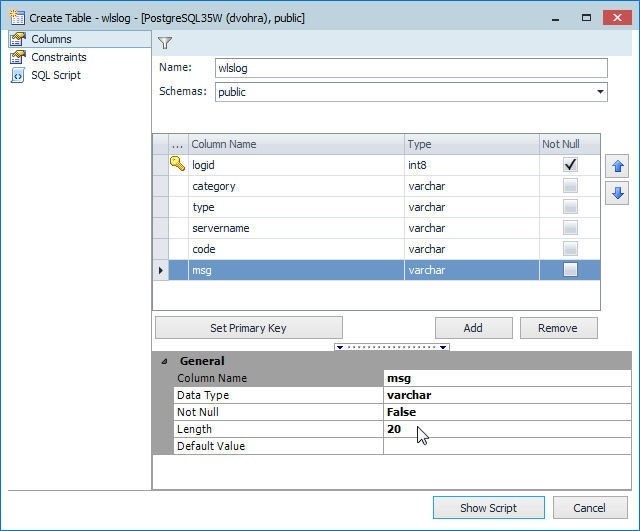 Select the option Select A Single existing table. The other option is A Single new table. The Target Connection is pre-selected. So are the Database (public) and Tables (wlslog). The Optimize block size is preselected by default to optimize the block size during import. Click on Next. 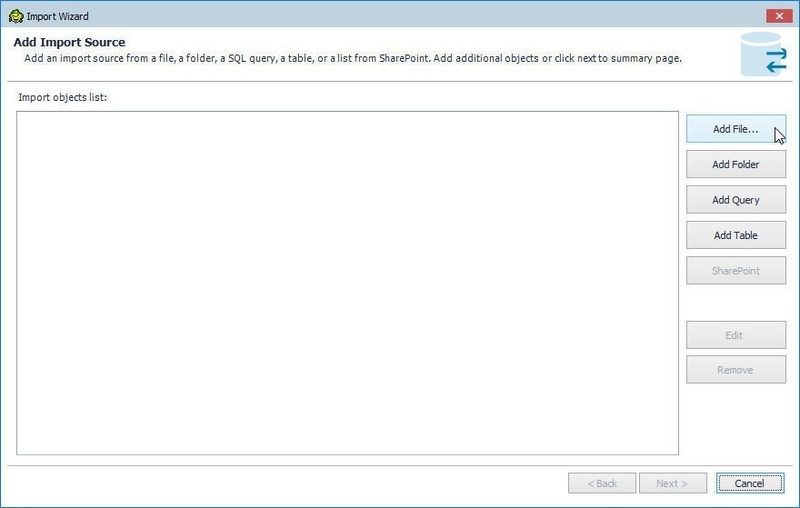 Next select the source file, folder, SQL query, table, or a list from SharePoint in Add Import Source as shown in Figure 56. In Save Settings as Template the options to Import Data Now, Import Data Later, or send to Automation are provided, as shown in Figure 57. Select the default setting of Import Data Now and click on Finish. When the import gets completed the Import Finished dialog gets displayed, as shown in Figure 58. The Read Rows column lists the number of rows read, the Imported Rows column lists the number of rows imported, the Status column lists the status of the import, and the File Name column lists the file used to import data from. In the Viewer Table wlslog launched by selecting Explore in the toolbar, the Data tab still does not list any data, as shown in Figure 59, even though the import has completed, because the Viewer Table needs to be refreshed. 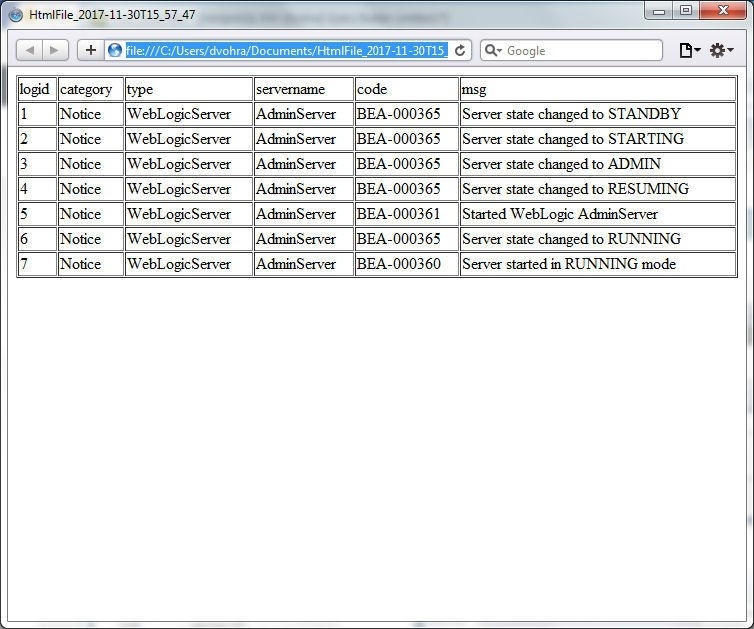 Click on Refresh as shown in Figure 60 to refresh the Viewer Table wlslog. The data imported gets listed, as shown in Figure 61. 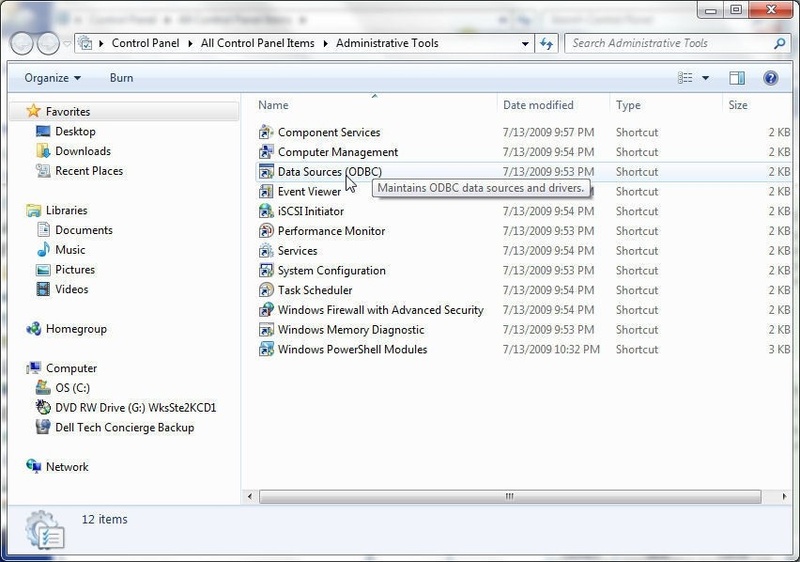 If while importing the connection gets disconnected, or the connection is disconnected to start with, right-click on the connection in the Navigation Manager and select Connect as shown in Figure 62. The Need More Information dialog gets displayed; in which, specify the Password and click on Connect as shown in Figure 63. A connected connection is shown in Figure 64. 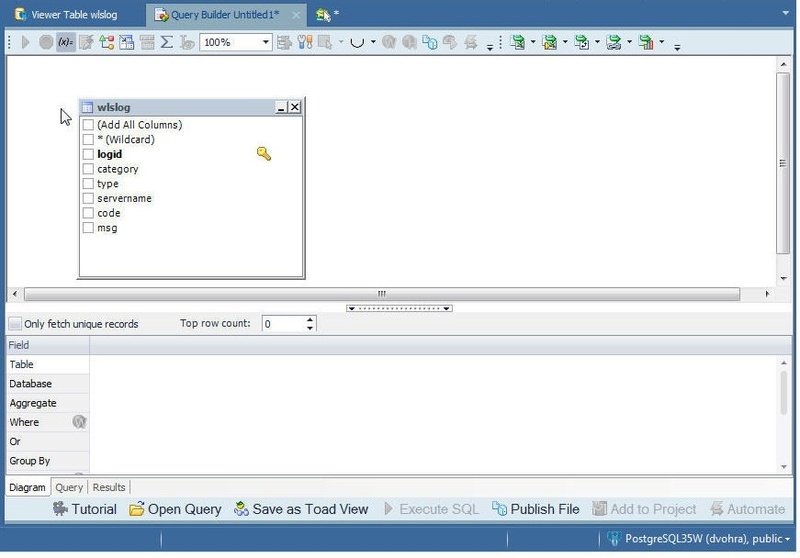 The Query Builder is used to query a database table. Click on Build>Query Builder as shown in Figure 65 to start the Query Builder. 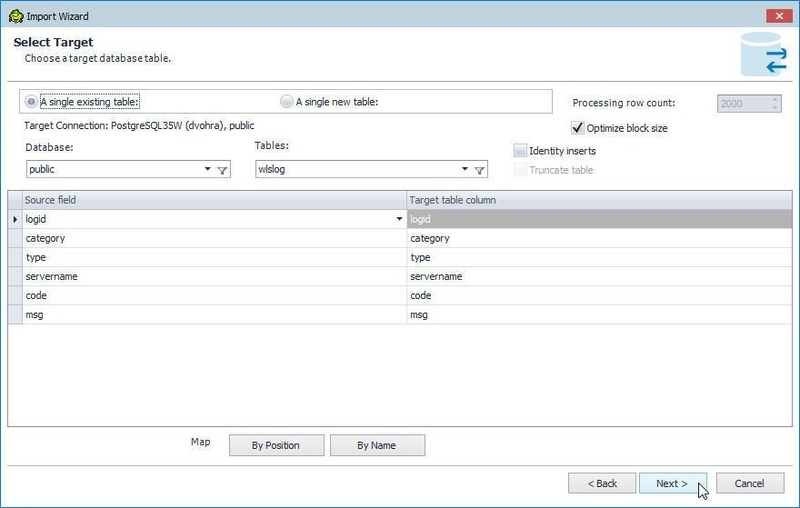 Select the wlslog table from the Object Explorer and drag to the Query Builder as shown in Figure 66. A class diagram for the table gets added, as shown in Figure 67. The columns to add to the query that is automatically generated may be selected from the diagram. 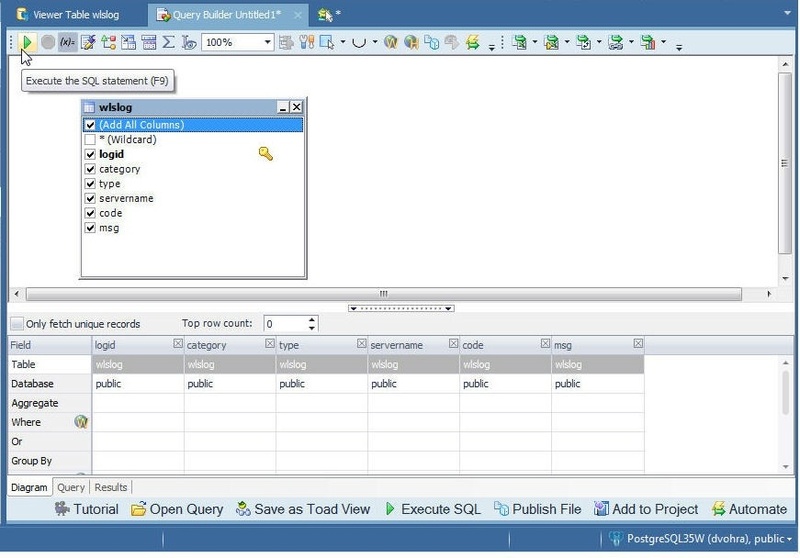 Select the option Add All Columns as shown in Figure 68 to select all columns to add to the query. Click on Execute the SQL statement as shown in Figure 69 to run the SQL statement. A result set for the query gets generated, as shown in Figure 70. 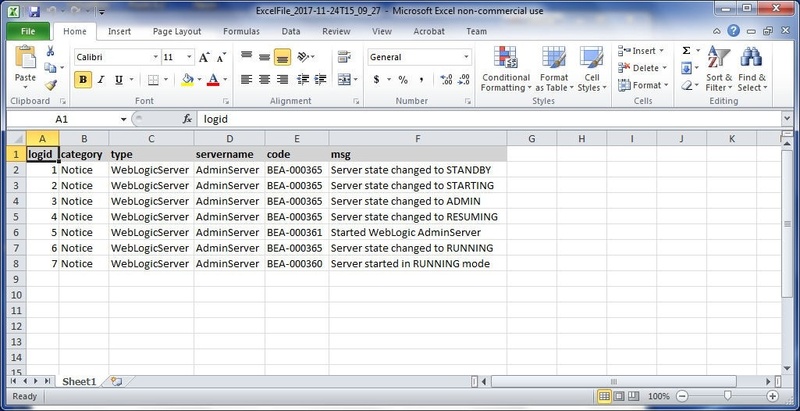 A result set data may be exported to an Excel report, CSV report or HTML report. Select HTML File from the drop-down as shown in Figure 71. When the export gets completed an Export Finished dialog gets displayed, as shown in Figure 72. Click on the File Name link to open the HTML file. The HTML File displays the data exported, as shown in Figure 73. If a single connected exists to a database the connection is the current connection, but if multiple connections exist only one of the connections is the current connection even though all connections could be connected. To demonstrate setting the current connection right-click on a connection and select Create Like… to create another connection, as shown in Figure 74. The Create New Connection wizard gets launched; in which, specify the Password and click on Connect as shown in Figure 75. A new connection gets created and gets set as the current connection, as shown in Figure 76. To make the connection that is not current as current, right-click on the connection and select Set As Current as shown in Figure 77. The connection becomes the current connection as shown in Figure 78. To disconnect a particular connection right-click on the connection and select Disconnect. To disconnect all connections select Disconnect All as shown in Figure 79. 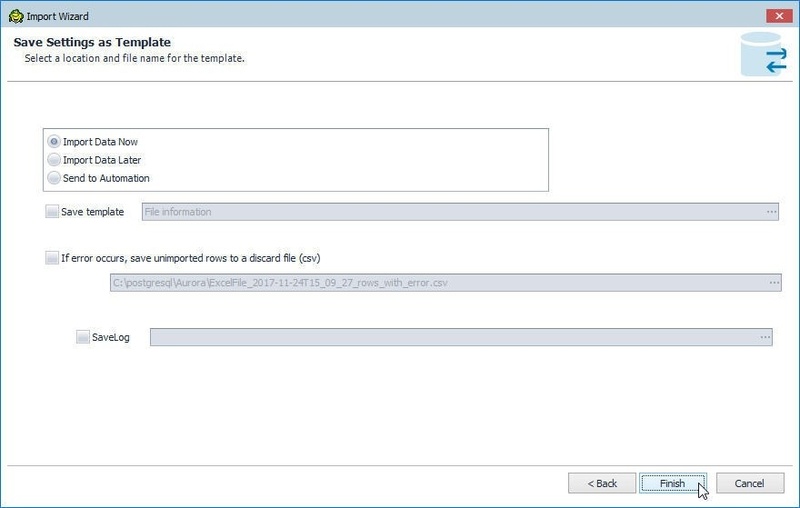 If any file that has been modified but not saved needs to be saved, a Modified File dialog gets opened with the option to save changes to the file. Click on Yes to save and No not to save, as shown in Figure 80. The file gets saved if Yes is selected and does not get saved if No is selected and the connection/s get disconnected, as shown in Figure 81. 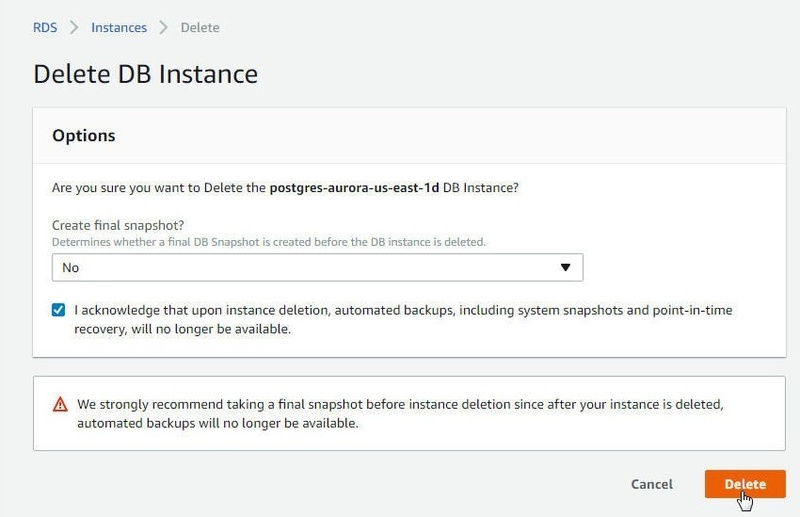 To delete the Aurora DB instances for PostgreSQL-compatible database select the instance to delete and select Instance actions>Delete as shown in Figure 82 for the Primary instance postgres-aurora. 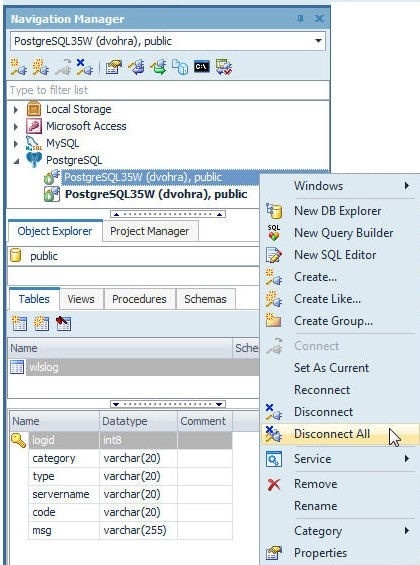 In Delete DB Instance click on Delete as shown in Figure 83. Similarly, select Instance actions>Delete for the replica instance as shown in Figure 84. For the read-only replica/s an option is provided to Create a final replica, as shown in Figure 85. Select No if a replica is not to be created and click on Delete as shown in Figure 86. The Primary Instance and the replica are shown to be deleting in Figure 87. In this article we discussed using a PostgreSQL-compatible Aurora DB instance with Toad Data Point. We introduced Amazon Aurora and Toad Data Point as a client to PostgreSQL-compatible Aurora. 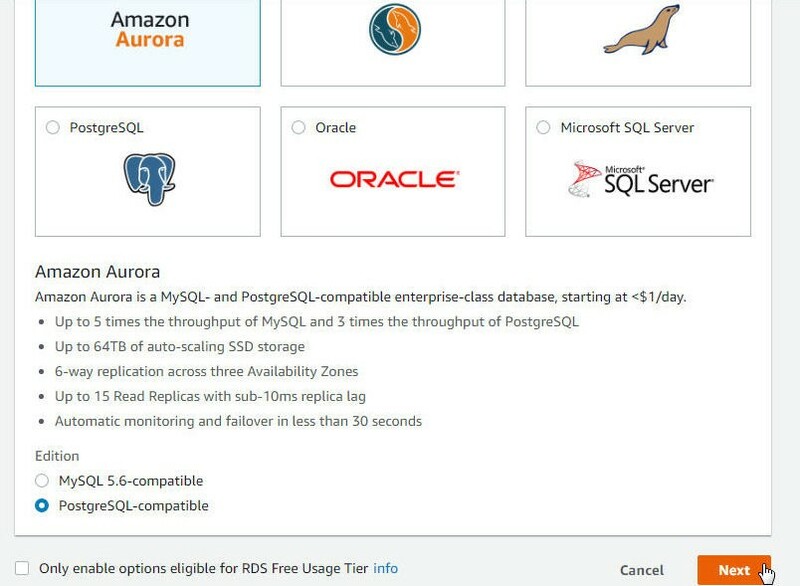 We got started by creating a PostgreSQL-compatible Aurora instance. Subsequently we created a connection in Toad Data Point to the Aurora instance. 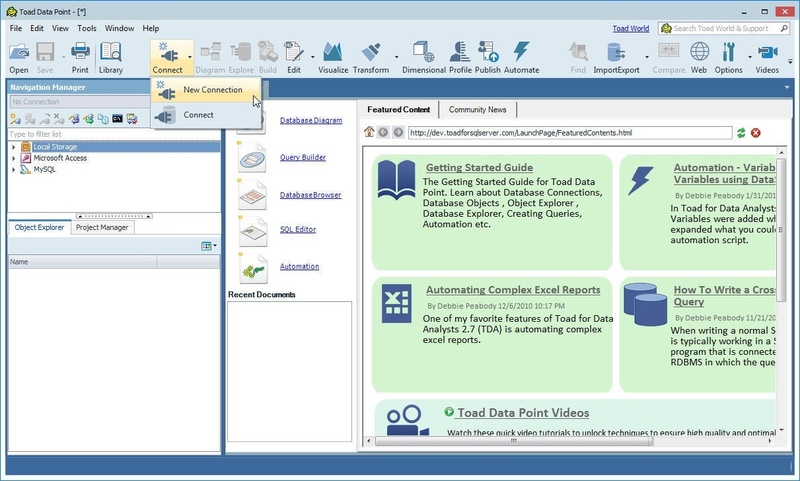 Then we created a database table and explored some of the other features of Toad Data Point as used with Aurora.